Day of the Finnish Flag has been observed annually since 1934. It is held on the Saturday between June 20 and June 26, on the same day when the Finns and the Swedes officially celebrate Midsummer Day. The design of the present-day Finnish flag dates back to the late 19th century. It was officially adopted in 1978. Just like the national flags of other Nordic countries, it uses the so-called Scandinavian cross, which represents Christianity. The cross is blue thus the Finnish flag is often referred to as the Blue Cross Flag (Siniristilippu). The ratio of the flag of Finland is 11:18. The civil flag and ensign has a blue Scandinavian cross on a white background. The state flag and ensign also has a coat of arms in the center of the cross. The military uses the swallow-tailed state flag. The president of Finland uses the swallow-tailed state flag with a Cross of Liberty, 3rd Class on the upper left corner. Day of the Finnish Flag is one of the Finland's official flag days. 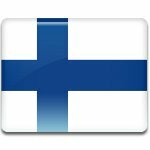 On the occasion, the flag of Finland must be flown from public buildings from 6 p. m. on Midsummer's eve until 9 p. m. the next day. This is meant to symbolize that during Midsummer's night darkness does not come to any part of the country.